Katie Kelly Bell has been writing about food, wine and travel for over a dozen years, with her writing appearing in publications such as Forbes, USA Today, Modern Luxury, Decanter and Southern Living. Her experiences have taken her from the vineyards of Argentina to the press houses of Champagne. In between, she has co-authored a travel guide to Ireland, The Everything Guide to Ireland, written a city guide for Atlanta and worked as a Senior Editor at The Wine Report. Katie also appears on the CNN Airport Channel as a travel expert and on WSB Atlanta radio, talking about wine. Katie has travelled the world exploring many sides of the wine ecosystem and she lives in Atlanta with her three kids, one dog and a very patient husband. What was Katie’s experience with exploring Champagne with Isiah Thomas? What was it like to taste the world’s best wine? How was the vineyard of the world’s most expensive wine sabotaged and held ransom? What did Katie learn about the natural architecture of Burgundy, France? How do Burgundy’s unique assets contribute to the wines produced in the region? What does the famed Domaine de la Romanée-Conti taste like? What did Katie cover in her controversial Forbes Magazine column that got over a million views? How do doctors recommend enjoying wine in moderation? What is Katie’s take on Robert Parker, the man with the golden palate, and his impact on the wine world? What’s so special about the Vosges forest oak trees? Should oak be considered part of the terroir? How are wine barrels prepared? What is the best piece of wine advice that Katie’s ever received? What is Katie’s favourite wine gadget? Welcome to episode 11! Before we get started, I want to give a shout out to Encaustic Art for her review on Apple Podcasts, “If you’re looking for a good source of wine information, your best bet is to follow Natalie. These podcasts are filled with interesting experiences. She’s easy to listen to and I also like the idea of bringing in other experts from the wine world.” She signs off with Happily Unreserved. I’ll continue to give a shout to others who’ve been kind enough to leave a review, so if you want me to mention your website or social media handle, please include that in your review, along with your name. Now, back to this episode. 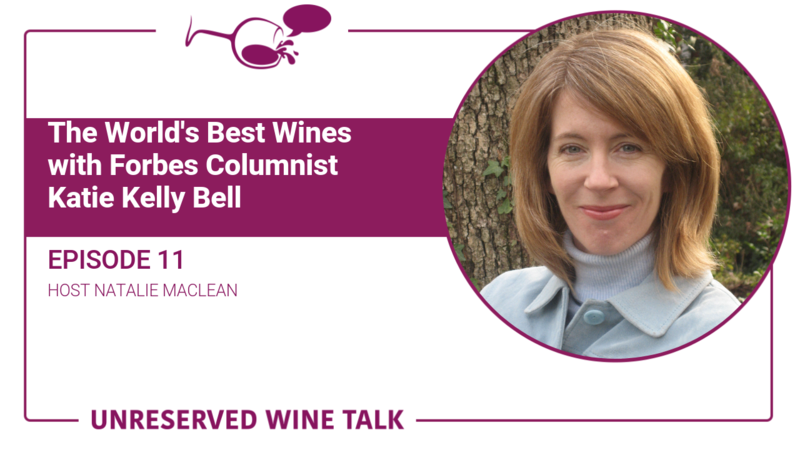 We’re chatting with Katie Bell, wine columnist for Forbes magazine. This is a fascinating chat in which she tells the story about how the vineyard of the world’s most expensive wine was held hostage for ransom, why she’s skeptical about the latest health and wine study results and whether she thinks that US critic Robert Parker can make or break a winery. You can get the full transcript of this episode and also watch the video interview with Katie that includes bonus content and behind-the-scenes questions and answers that weren’t included in this podcast. In wine, as with the rest of the world, the greater the achievement, the humbler the creator. Aubert de Villaine is case in point. You can get a much firmer understanding of a wine region by visiting it, especially when the region is as confusing and sub-divided as Burgundy is. Robert Parker Jr. is and has been one of the most powerful wine critics in the world whose influence can affect wine prices. However, the internet and social media have done much to diffuse that influence. I love that Robert Parker believes that the future of wine is in online wine classes… I’m all in! Oak ageing wine has a long and storied past and can be used for both good and evil when it comes to making wine. Good being adding extra nuances to the taste, bad being covering up winemaking mistakes with too much of it. You’ll find links to social media channels, reviews for the wines we discussed, and bonus tips for this episode at nataliemaclean.com/11. My next guest on the show will be another Forbes wine columnist, Cathy Huyghe, and we’ll be chatting about women and wine in the lead up to International Women’s Day. Finally, if you want your ability to pair wine and food to the next level, join me in a free online video class at nataliemaclean.com/class.